The American Cancer Society tells us that one in every 3 women and one in every 2 men get cancer in the US today. The Centers for Disease Control tell us that 85% of illness in the US is due to emotional causes– and that includes cancer. We are all vulnerable! Cancer Prevention and Treatment is the newest of the AIT seminars. Its success is based on two ideas, first, that each cancer has many causes and second, that all of them are types of trauma– physical, psychological, and/or spiritual. By treating these traumas and their connection to the cancer that has developed, AIT can produce improvements in longevity and, even, remission. These groundbreaking new methods are also being used to prevent cancer. 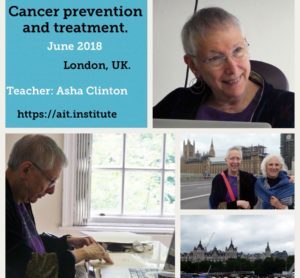 In June, Asha Clinton, AIT’s developer and the Advanced Integrative Therapy Institute’s founder, taught this seminar in London (UK) to rave reviews. She will teach it again ON LINE this coming November 29, 2018. 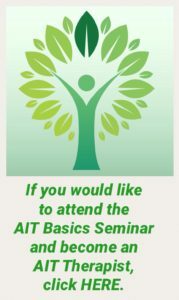 It is in your highest interest both as an AIT practitioner and as a person, to attend. Click HERE for more information of Cancer Prevention and Treatment. If you want to attend this Seminar, please CLICK HERE.